Look at that face, just look at it! 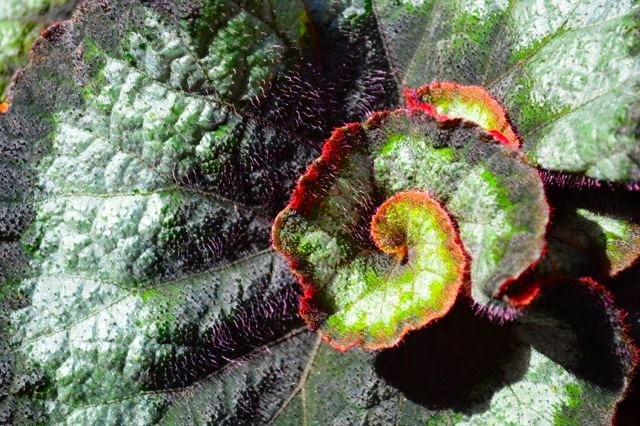 Who could resist Rex begonia (Begonia rex-cultorum) ‘Escargot’? Not me, it seems. Despite her better judgement, Helen the House Plant Killer has become the owner of a slightly fussy Rex begonia ‘Escargot’. The showy leaves with their whorled, snail-shell centres wooed her, that is, er, me. In fact, we’ve managed to live together now for a few months. Yes! Rex begonias need bright, indirect light and well-drained soil with a particular level of moisture, neither too wet nor too dry. In fact, you shouldn’t let them dry out completely. The latter is a challenge for H the HPK. It remains to be seen whether mine survives long enough to look like the monumental beauty photographed this weekend at the Montreal Botanical Garden. Snail to the chief! This is my dream escargot-à-go-go! I love Rex begonias! They do very well for me outside in the summer but the whole not letting them totally dry out thing is a challenge inside and the plants totally droop and look half dead if you forget to water them. Crazy. Love the one in your pictures. We should have a staff to care for our houseplants! I agree about the staff thing, Peter. And I deliberately try to keep my houseplants on the ironclad side to minimize the need for current staff (that would be me) to fall behind on the watering. First fell in love with 'Escargot' as an outdoor container plant, so perhaps mine will take an outdoor vacation in a shady spot this summer. I'm liking this begonia a lot, such a striking pattern. I'm guessing we'll see more begonias bought in the garden centers due to the powdery mildew decimating impatiens. Paul, from what I understand, the so-called New Guinea impatiens aren't susceptible (or perhaps not AS susceptible) to the killer mildew that's killing the shorter ones. Will double-check that fact and report back. Thanks Helen, good info for other readers! If I had a humid, shady spot that would be watered all summer, I'd go for a few Rex myself. But mostly I love photographing them – they're lens eye candy, as you've discovered. Wow! What else can I say. I don't do begonias because shade is such a rarity in my garden. Wow, that’s an amazing plant, Helen. I would have been tempted by it as well – even though I really can’t keep housplants alive either! I don't like begonias – but this one is a bit astonishing. If you'd said they are easy to keep and I could put them in the garden and they'd all look like the weird pile of leaves in the second picture, I'd probably succumb and have one in pride of place and get everyone to come and look at it. Seem to have been saved by difficulty! 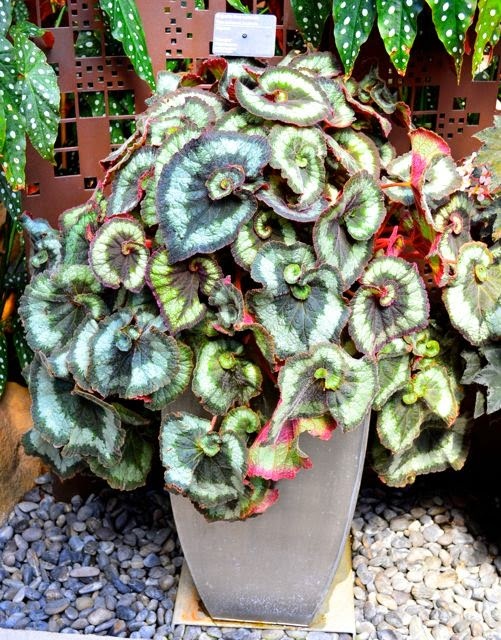 Hello…Can you advise where a person can purchase one of these amazing Escargot Begonias…I live east & north of Toronto. Hi, Carolyn, I confess, I actually got mine at Home Depot. But northeast of Toronto, I'd try the houseplant department at Sheridan Nurseries in Unionville (or any large garden centre). Phone around, you might find it elsewhere, too. Good luck!